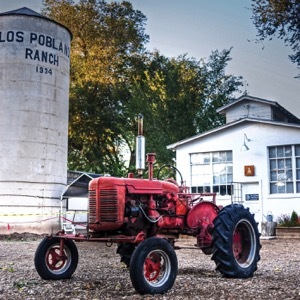 In ironic contrast to New Mexico’s meth trafficking headlines, the Los Poblanos Organic Farm and Historic Inn in Albuquerque is a magical tangle of herb gardens, sunflowers, lavender fields, and roaming peacocks. Sleep In A Real Farmhouse. Accommodations come in the form of dairy-style farmhouses built in the 1930s. They’re bare-bones chic with pretty Coyuchi linens, chunky handmade soaps, and simple canopy beds. Spring for the largest suite (from $350 per night), which comfortably fits a large family and includes a full kitchen, living room, and spacious patio. For an additional $20 per child, the Little Farmers Package welcomes young guests with crayons, sweet farm animal stuffies, cookies and milk, plus tickets for the Explora Children’s Museum in town and a scavenger hunt around the property. Meet A Farmer, Chase A Peacock. A resident reaper is on hand to help kids pick carrots or plant lettuce seeds. Children are also invited to roam the sunflower fields (photo op!) and cut down their own stalks to create gorgeous bouquets. A Zen-like herb garden dotted with elegant vintage garden chairs provides the perfect pocket for late afternoon coloring. There’s also a saltwater pool nestled along a pergola of fragrant and vibrant lavender and stunning peacocks on the loose. Time Your Trip With This Glorious Scene. The Albuquerque International Balloon Fiesta happens from October 1-9 and is truly spectacular. There’s music and great food, but you’ll want to book a ride before they fill up. It’s All About Oaxaca Smoked Salts And Lavender Chicken. As part of an ongoing but unobtrusive facelift, Los Poblanos has recently added 4,000 Grosso Lavender plants to its expansive fields. Gorgeous, yes. But yummy, too: the restaurant serves up organic seasonal fare featuring ingredients grown on-site. Standouts include the Lemon and Lavender Chicken and Chai Masala Ice Cream Sandwich. Over at the quaint Farm Shop stock up on homemade salves and perfumes (look for the ah-mazing Oaxaca smoked salts). Zoe Schaeffer is a former fashion and beauty editor, trend forecaster and retailer. She is now a contributor for the empowerment platform, Glam4Good, and has a lifestyle blog, Macaroon Original. She lives in Los Angeles with her husband and three daughters, Gemma, Rafi and Cleo. Follow her at @zoeschaeffer on Instagram.